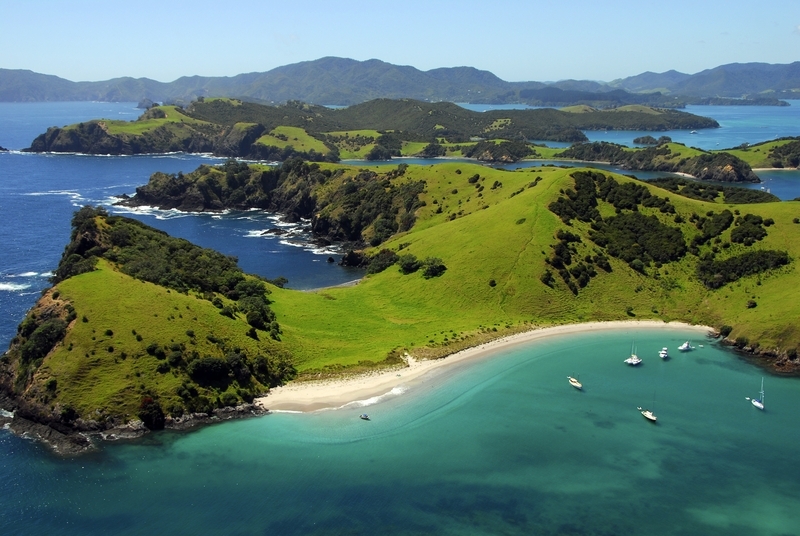 New Zealand yacht charters are centered around the Bay of Islands on the North Island of New Zealand, a few miles North of Auckland, the largest city in New Zealand. There are fully crewed yachts and several bareboat operating companies here including the Moorings that has a base in this area. From this base there is a 50-mile stretch of coastline sheltered by more than 80 islands with plentiful anchorages, quaint towns, and beautiful beaches. A Bay of Islands yacht charter is an inspiring adventure for the entire family. Unlike other parts of the Pacific Ocean, the weather for New Zealand yacht charters is variable at any time of year, the wind directions and velocities are also changeable. But, a land and sea breeze each day is typical. Navigation is straightforward. The tidal range is about six feet. Strong currents can run in narrow channels in certain locations, depending on the state of the tide, but generally aren’t an issue. In the Southern Hemisphere summer, November through April, the temperatures range between 75°F and 86°F (24°C to 30°C). New Zealand is an amazing “out-doors” place. If you’re a hiker, biker or walker, golfer or sailor. New Zealand is the place for you. Boating and yachting takes place mostly on the North Bay of Islands Islands since the waters get a lot colder down South. The New Zealander’s, mostly of Scottish stock, and the local Maoris are great sportsmen and very friendly. Also, if you like sheep, you;ll find a soul-mate here where there are a lot more sheep than humans. Lamb (pronounced LIM) is prepared in every conceivable way known to man. If you are a Rugby player, you’ll see some great matches here. If you have any questions about our New Zealand Yacht Charter offerings call us at (877) 759-8263 or contact us by email today.